Research recently released by the Food and Drug Association shows a spike in teenagers’ use of nicotine products, 77% of high schoolers reported to admitting the use of tobacco products. The culprit? 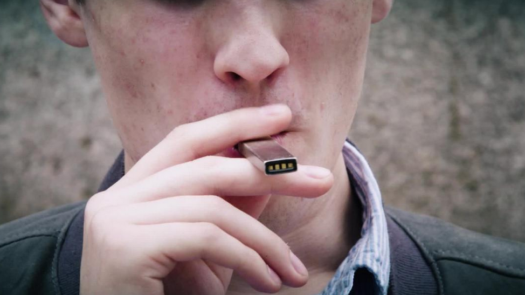 JUUL and other e-cigarettes. One has seen these electric options as “safer” than the traditional cigarette. That has validity, it being reported that those who use both e-cigs and regular cigarettes had three times more carcinogens contained in their urine. But the same report, released by the University of California San-Fransisco, observed that those who only used e-cigs still had a toxin content three times higher than those of their peers that did not smoke at all. The data comes from those of a pool of 100 high school students. JUUL tried to avoid the regulations being set in place via voluntary action. They pulled the sale of nicotine flavors from retail and also deleted their social media accounts (those cited as a means to access the younger generation). They are not trying to hide the fact that they are nicotine-free. Their own website explains that a JUULpod is the equivalent of 20 cigarettes (in nicotine content) and that every single pod flavor they have contains nicotine. They have even added a mission statement to stress that their products are aimed at those who are 21+. However, the FDA is still moving for regulation, banning sale of flavored e-cigarettes as well banning menthol products. They also call for stricter age verification for online sales of JUUL products (JUUL being the biggest e-cigarette company as of recently). “I don’t like the regulation of tobacco at all–it really should be up to the consumer to choose,” Connor Kramer, junior, said. The social media accounts being deleted lends itself to following the trend of them appealing to young kids. Gen Z is the social media generation, so to have accounts where kids can interact with the brand in ways is violation of the regulation that cigarette companies cannot advertise to minors.